Stalled: In the past years, these only visible sign of development were the concrete beams for Casa Gemilang in Sg Pusu, Gombak. For the property buyers of Alam Perdana Court in Ijok and Casa Gemilang in Gombak, their dream home is still far from reality. They have laboured through many years to resolve the issues surrounding the projects. The buyers were caught by surprise that the land in both development was marked for agricultural purpose instead of residential, and this status has left them in limbo until today. The Casa Gemilang project consists of Desa Gemilang double-storey terrace houses and Casa Gemilang service apartments and townhouses launched in 2003. Phase 1 of Desa Gemilang ran into trouble over the environmental impact as it was sited next to a slope and encroaching into a forest reserve. A stop-work order was issued by Selayang Municipal Council in 2006. Casa Gemilang buyers committee chairman Jaafar Ismail said the developer faced many issues, hence the project dragged on for many years as the company failed to comply with safety standards. “Unfortunately, according to the Housing Development Act 1966, townhouse comes under commercial development, therefore it does not fall under the purview of the Housing and Local Government Ministry (KPKT) before 2007. “However, our main question is how did the developer manage to develop a project on agricultural land,” he asked. Jaafar said 40% of disbursement had been paid out by the bank, which came up to about RM6mil, but there is no construction at the site for Casa Gemilang. “The project was marked as abandoned by KPKT on Jan 9, 2009 and the ministry had been unable to help us. “ We want to know what happened to our money totalling RM6mil paid via disbursement, because the project does not seem like it will ever take off based on what we have seen so far,” he said. “We staged a protest in front of the developer’s office on Jan 18, 2011 as patience was running thin. “At the time, the developer agreed to return the deposit and payments made for those whose sale and purchase agreement was still valid. “But the developer tried to get buyers to sign the Deed of Rescission and Revocation that was never referred to the bank and was biased so we advised the buyers not to sign anything,” he added. For Dr Roslina Ab Wahid, chairman of the Alam Perdana Court bungalow lot purchasers group, her woes began in 2002 when she purchased a lot and the developer failed to pay the premium to develop the land. The project consisted of bungalows, single-storey and double-storey houses spread over 400ha of land, affecting some 400 buyers. Although part of the development had been completed, the project was abandoned. “I had purchased a bungalow package worth almost RM100,000 only to find out that it does not belong to me. “The land was confiscated by the state government in November last year. Now the state government is trying to revive the project and make it livable as it is full of defects. “The state government said the houses will be delivered in March while the plight of the lot purchasers woudl be looked into after the infrastructure on site is fixed,” said Roslina. At a recent meeting with the buyers, Selangor Mentri Besar Tan Sri Khalid Ibrahim said the state had paid RM147mil to acquire the land for the stalled Taman Alam Perdana development from developer Ladang Bukit Cherakah Nominees Sdn Bhd (LCBN), so that construction of the houses could resume. An additional RM40mil was allocated to complete the infrastructure for the project last year. The Association for Abandoned Building Owners Malaysia (Victims) chairman Dr Mohamed Rafick Khan Abdul Rahman said the root of this problem was the weakness of the Housing Development Act as well as the lack of regulation and enforcement by the authorities. He said it was a common practice by developers back then to develop land without conversion, leaving that process till later when construction work was ongoing. “Since land is a state matter, the state government can impose a deposit payment on developers as a condition if they want to develop any land. The state can determine the value of the land before development commences; should the developer fail, the money can be used for the project. “In the case of Alam Perdana Court, the state government could have taken legal steps jointly with the buyers or resolved the issue of the bungalow lots immediately by getting the buyers to pay the premium and issue the title,” he said. KOTA KINABALU: Sabahans have yet to tap into the Government’s My First Home scheme that enables young Malaysians to own a home. The response to the scheme has been lukewarm despite potential buyers being offered 100% loans, Deputy Housing and Local Government Minister Datuk Lajim Ukin said. He said at the Federal level, the scheme was coordinated by the Finance Ministry through an appointed agency while at state level, it was handled by the state government. “I am sure the state government has taken proactive steps to get the scheme rolling in Sabah and also impart information about it to the younger generation through various departments and agencies in the state,” he said after attending a ground-breaking ceremony for a mosque in Kampung Melabau, Beaufort, yesterday. Lajim said under the 2012 Budget, the Federal Government had increased the eligibility of buyers earning from RM3,000 to RM6,000 and also increased the value of houses from RM200,000 to RM400,000. He said the new eligibility under the scheme had been effective since Jan 1. He said the scheme was to help the younger generation entering the job market to buy an affordable house. The developer of Casa Gemilang in Sungai Pusu, Gombak said they have been victimised by the policy of state government, resulting in the project being delayed. Gemilang Excel Holdings Sdn Bhd administrative manager Azman Rosdi said the company was stuck between a rock and a hard place. He said the state government had approved the development but it was also one that contributed to the delay factor, thus causing the chain of events. 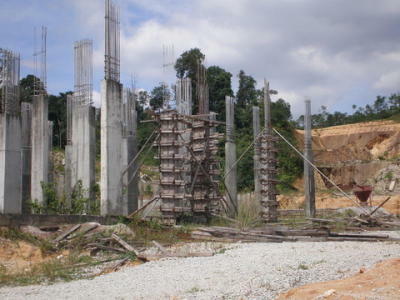 In July 2006, the developer was slapped with a stop-work order following a landslide in Kampung Pasir. The order was issued to all development near hillsides, which affected Desa Gemilang and Casa Gemilang. “We held a series of meeting with the state because we had to meet our deadline by 2008 for the project, but the state upheld its policy. We told them that we buyers are bound by an agreement to about 200 but in the end we had to comply with the order. “In 2009, we made an appeal and the stop-work order was revoked. We resumed work on the site but the banks did not want to pay the progress claims because of the economic crisis and they said the project was not viable. “We could not resume construction without any payment, so we had issued a notice to terminate the sale and purchase agreement (S&P) to some of the property buyers. “The 40% of disbursement money had already been used for site clearing, earthworks and piling. We are still here trying to find a solution to this,” he added. Azman said the buyers were offered a refund for the project but they had to terminate the earlier S&P. “We contacted the buyers to sign the Deed of Rescission, which some signed, and the money will be reimbursed within 24 months. We have not received any offer from the state government or agencies pertaining to the project; they told us to just fix the problem,” he said. Azman also clarified the issue of building on agricultural land, stating that they had filed an application simultaneously to change the land status to residential and bordering under the Land Code Section 124A for Gombak district to the Selangor Land Office in October 2005. He said if people conducted a search on the status now, the land would still be classified as agricultural because the change would be applicable only when individual titles were given out. “We have paid the premium for the land and the state government then had approved the change of land usage on Nov 29, 2004. Everything has been done according to the law. “As for the encroachment into the buffer zone, that was for us to carry out slope-stabilising work and the developer’s land and the reserve were bordering each other. “We had written to the Forestry Department for permission but no response was ever given even after nine months of waiting, so we went ahead with the works as it was the monsoon season,” he said. At present, Azman said the company was looking for interested parties who wanted to buy over the project but it had to be done accordingly. KUALA LUMPUR: Pavilion Real Estate Investment Trust (REIT) posted a net profit of RM12.4mil for the fourth quarter ended Dec 31, 2011 on revenue of RM22.5mil. Pavilion REIT was listed on Bursa Malaysia on Dec 7, 2011. In the notes accompanying its results, Pavilion REIT said gross revenue for the period totalled RM22.5mil and net property income was RM16.3mil. Management fees and borrowing costs incurred during the period were RM1.2mil and RM2.3mil respectively resulting in income before taxation of RM12.4mil. Its distributable income for the period under review amounted to RM13.1mil, or 0.44 sen per unit, consisting of realised income of RM12.4mil and non-cash adjustments of depreciation, amortisation of borrowings transaction cost of RM100,000 and surplus cash arising from 50% of manager's management fee payable in units of RM600,000.